we are a Nikon oriented site, so we are very interested by your development policy about our common passion : Sigma equipment, not only Nikon compatible lenses, but also your amazing Foveon cameras. 1) Your italian network (MTrading) appear us to be more open-mind than every other competitor : do you think in the next future to increase test equipments (also beta versions) to lend to a determinate sample of users in order to obtain more feedbacks ? Yes, we're always happy to provide the samples with you. With regard to the beta samples, I don't think it possible to lend it to you before we finalize the product development. 2) We know that the Japanese industry is very reluctant to open up their programs in advance for not to encourage competition, however, there is a risk that customers buy a novelty and then not have the budget to the next your big lens, even more interesting for them. S We think that a public roadmap of future presentations of new photographic equipment can greatly help customers in programming their purchases. Do you have forecasts about a Sigma road-map of your next products and also about your future planning ? A 12-18 month roadmap will be great ! Every product development always has a risk. Even we start the project, we may need to terminate it due to some problems such as market change, technical problems, etc. Therefore, even if we disclose our product roadmap, we can't guarantee it. In this case, it would not be very nice to the customers. It only creates the conflicts. I hope you understand. 3) How are your relationship with Nikon co., after the lawsuit filed some years ago ? It's more difficult develop lenses for Nikon F mount than other mounts ? Not really. Only one challenge for us is the technical issue. Nikon F mount is smaller than other mounts, so it's not easy to develop the high quality high speed lenses that fits both Canon EF and Nikon F mount. Are there some anticipation about improvements on af sensitivity and S/N rate of these cameras? About dp series, is unthinkable to imagine a built EVF in future versions ? We always try to improve the performance of our cameras. You can expect the better performances in the future cameras from Sigma. 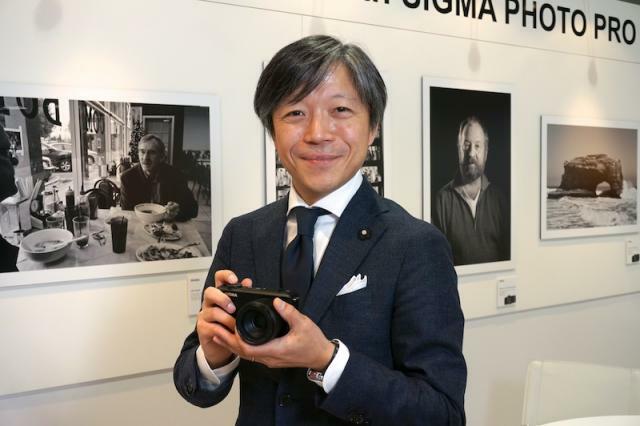 5) Could we expect a 24x36mm Sigma camera or even a large format Sigma camera ? Is it scheduled in the future ? Sorry, but I can't comment on the future product development plan. I hope you understand. 6) We very much appreciated your lens partition between Art, Sport, Contemporary: in every one of these we'd like to find many most wanted focal lenghts. Same thing about a particularly needed Sigma 70-300/4 OS Sport instead of older, obsolete ones. Do you think we could expect some other good news about ? Same as the question above, I can't make comment on the future product development. I hope you understand. Again, I can't make comment on the specific product development plan, but you can always expect more "exotic" lenses from us. We always try to bring you the innovative, exotic products to photo enthusiasts. 8) Nikonland has tested (and successively bought) many of your last masterpieces as Art 20/24/35/50 f/1,4: how is Sigma balance about selling them ? 35mm is always the best seller. 50mm follows it, but 20mm and 24mm are also popular among the landscape photographers. 9) Considering Sony mirrorless cameras, Nikonland realized that lacks a complet offer of small and cheap lenses, as your three ones (Sigma 19/30/60mm Art) that cannot fill all needs. Do you planning something about this mount - cheap and light - or you will follow same Sony premium orienting policy (so as you're doing with success for Nikon and Canon) with big, heavy and expensive full frame lenses ? For now we imagine mirrorless as a lighter and cheaper solution, quite the opposite of big, heavy and expensive full-frame reflex. Again, I can't comment on the future product development. As a generic comment, the relationship between the size and weight of the lens and the optical quality is a trade-off. If we're to achieve the best performance, it would be big and heavy lenses. 10) Who produces Sigma optic glass, and where? We make our glasses. If you refer to the glass materials, HOYA and Ohara, both Japanese companies. 11) What you would not do again that which has been done over the last four years? Sorry, but I couldn't understand this question !